Chōbunsai Eishi was a pupil of Kanō Eisen and was given his artist’s name by Lord Tokugawa Ieharu (1737-86). 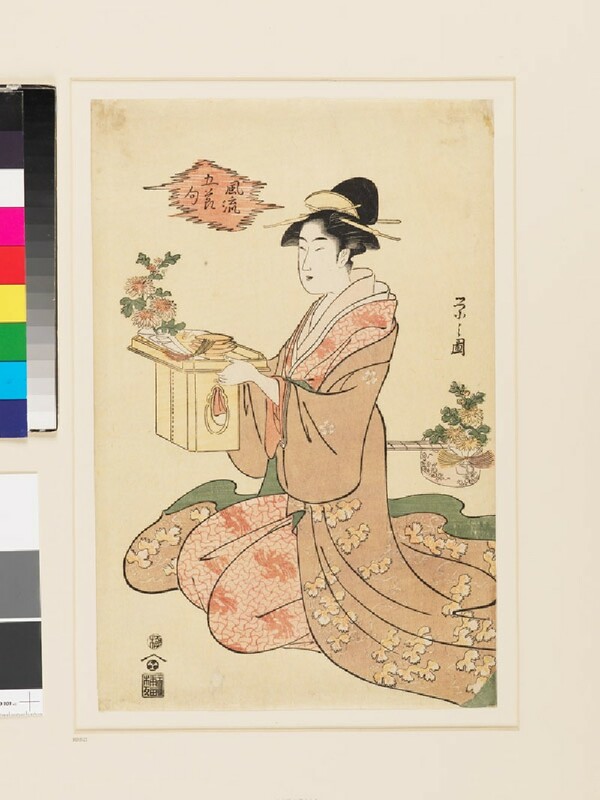 He was one of the leading ukiyo-e artists, along with Utamaro and Kiyonaga, between the Tenmei and Kansei eras (1781-1801). Each had his own style, though they greatly influenced each other. 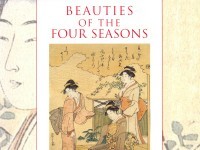 The beauties depicted by Eishi were elegant, refined, idealized portraits owing much to the style of Kiyonaga. A lady from a samurai family is holding out a chrysanthemum and a sake cup on a formal wooden tray as an offering, during Chōyō (the Chrysanthemum Festival). Behind her, there is a sake-pot containing Chrysanthemums to celebrate the festival. Chōyō is the time for changing the type of kimono from awase to menire-kosode (cotton padded short-sleeved kimono) at the end of autumn. Fūryū Go-Sekku originated from the five celebrations of the year, which then included 7th January for wishing for peace, when one ate rice porridge with seven spring herbs (Jinjitsu), 3rd March for celebrating girls’ growth by decorating dolls (Jōmi), 5th May for purifying spirits with decorations of iris (Tango), 7th July for the Star Festival wishing for improvement of calligraphy and sewing by praying to the stars (Tanabata), and 9th September for the Chrysanthemum Festival (Chōyō). Presented by Mrs Allan and Mr and Mrs H. N. Spalding, 1952.